Isaiah Berlin's parable about hedgehogs and foxes has long since served as a thought-provoking lens for looking at science and scientists. Berlin quoted the Greek poet Archilochus who said "the fox knows many things, but the hedgehog knows one big thing". Scientists who spend most or all of their careers drilling down deep into one field, problem or idea are hedgehogs. Scientists who instead spend their careers sniffing out and solving interesting problems from several areas are foxes. How does the dichotomy apply to chemists? 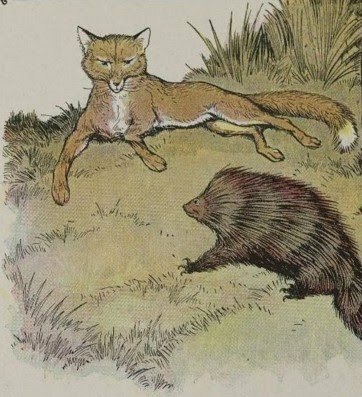 At the outset, one thing seems clear: chemistry is much more of a fox's game than a hedgehog's. This is in contrast to theoretical physics or mathematics which have sported many spectacular hedgehogs. It's not that deep thinking hedgehogs are not valuable in chemistry. It's just that diversity in chemistry is too important to be left to hedgehogs alone. In chemistry more than in physics or math, differences and details matter. Unlike mathematics, where a hedgehog like Andrew Wiles spends almost his entire lifetime wrestling with Fermat's Last Theorem, chemistry affords few opportunities for solving single, narrowly defined problems through one approach, technique or idea. Chemists intrinsically revel in exploring a diverse and sometimes treacherous hodgepodge of rigorous mathematical analysis, empirical fact-stitching, back of the envelope calculations and heuristic modeling. These are activities ideally suited to foxes' temperament. One can say something similar about biologists. The dominance of foxes in chemistry is demonstrated through its long history. Robert Boyle, the first modern chemist who is widely credited for separating chemistry from alchemy, is of course universally known for Boyle's Law but also made contributions to understanding combustion, respiration, color and electricity. The father of modern chemistry, Antoine Lavoisier, discovered the all-pervasive law of conservation of mass, preceded Mendeleev in putting together a tentative classification of elements and pioneered chemical book-keeping (stoichiometry). Similarly, the great chemists of the nineteenth century- Davy, Wöhler, Liebig, Kekule, Mendeleev- were all foxes who, while known for one or two important discoveries, worked in diverse facets of their chosen discipline. Chemical foxes also proliferated in the twentieth century, with Lewis, Langmuir, Curie, Fischer and Sanger being typical examples. Linus Pauling was the ultimate fox, but more on that below. This does not mean that chemistry has no use for hedgehogs. Far from it. If there's one field of applied chemistry which has reaped riches from hedgehogs' talents, it's crystallography and especially protein crystallography. Crystallography also belongs to physics and biology, but it has enough of a crucial chemical component for crystallographers to call themselves chemists. Among crystallographers, Max Perutz was a hedgehog par excellence. Perutz spent his entire career shining his intellect like a laser beam on the structure of hemoglobin. It was largely his efforts that turned hemoglobin into one of the best studied proteins that we know and it was because of his extensive studies on it that we gained insights into some of the most general and important concepts in protein science, including cooperative effects and allostery. The chemists who won the Nobel Prize two years ago for their solution of the ribosome structure were also supremely focused hedgehogs. Special mention must be made among this trio of Ada Yonath, the "mother" hedgehog who made the ribosome her life's mission and stuck with it longer than anyone else. There are also hedgehogs in some other subfields of chemistry. For instance, Rudolf Marcus who spent his lifetime developing a comprehensive theory of electron transfer processes comes close to being a hedgehog. Similarly, Peter Mitchell is known for one big thing- the development of the fundamental theory of chemiosmosis which is of paramount importance in understanding biological energy transfer. In every science there are also a few unique individuals who seem to be able to magically morph into both hedgehogs and foxes. The greatest chemist of the century belonged to this class. During his life, Pauling was known especially for the astounding diversity of his contributions and this puts him squarely into the fox camp. But remarkably, the hedgehogs could also claim him as one of their own since the depth of his contributions easily rivals the breadth of his interests. If Pauling had made no other contribution except his theories of chemical bonding, he would have still been hailed as one of the century's great chemical hedgehogs. That Pauling managed to be a fox and still made hedgehog-like contributions to at least three key fields (quantum chemistry, protein structure and molecular medicine) attests to the stature of his accomplishments. Among twentieth century scientists, Enrico Fermi is the only individual in my opinion who commanded both depth and breadth of this magnitude. It is much harder to locate hedgehogs among organic chemists. The greatest of organic chemists, R B Woodward, was undoubtedly a fox, albeit one of the highest caliber. Other leading figures in the field like Corey, Stork, Djerassi, Westheimer, Breslow and Danishefsky have also been first-rate foxes. Interestingly, there are hedgehogs among synthetic chemists but they are not as well-known. One that comes to mind is the chemist John Sheehan who spent fifteen years of his life trying to synthesize penicillin. Even the great Woodward had stayed away from this molecule's perilous, highly strained beta lactam ring. Sheehan recounted his single-minded obsession in a highly readable book with a fitting title- "The Enchanted Ring". Another organic hedgehog was H C Brown who devoted his career to perfecting the chemistry of boron. Yet another example is George Olah who has had a fifty-year love affair with the chemistry of carbocations. Also, as Derek Lowe hints, organometallic chemistry may yet be a field full of hedgehog riches. The chemists who developed palladium-catalyzed reactions and olefin metathesis were very hedgehog-like. Many leading contemporary chemists on the other hand are exceptionally gifted foxes. Harry Gray, Stephen Lippard, Stuart Schreiber, George Whitesides, David Baker, Jean-Marie Lehn, Ad Bax, Alan Fersht, Jacqueline Barton, Martin Karplus, Roald Hoffmann, Paul Schleyer, Christopher Dobson, C N R Rao, Donna Blackmond, Chad Mirkin, Eiichi Nakamura, Fraser Stoddart, Ken Houk and Dieter Seebach are but a few examples of individuals who have made first rate contributions to diverse areas of chemistry. In fact, there can be no better tribute to their identity as foxes than the fact that many of them could also be easily classified as physicists or biologists. We mentioned the quintessential nature of chemistry as a field of dreams more attractive to foxes rather than hedgehogs. Why is this so? In chemistry unlike physics, overarching general principles are not as important as specific instances and diverse manifestations of these principles. Key unifying principles of course exist and are taught to every budding college chemist, but they are often not as deep compared with general laws in physics or theorems in mathematics. For instance, the theory of acids and bases or that of hybridization is undoubtedly a unifying theory, but it's more a set of rules derived through a mix of theoretical analysis and empirical facts. Few would equate acid-base theory with Maxwell's laws of electromagnetism, the laws of thermodynamics or the theory of Lie groups in terms of depth, fundamental importance and universal applicability. In addition, unifying concepts in chemistry (free energy, crystal field theory, conformational analysis, oxidative phosphorylation, solubility laws) are usually fathered by several individuals and not just one. The ideal of the lone thinker shunning himself or herself from society and heroically wresting nature's secrets from her grasp through single-minded pursuit is an ideal that is alien to chemistry's nature and practice. Finally, many key chemical contributions consist of methods or instrumental advances (NMR, crystallography, gene sequencing, chromatography, PCR) that are necessarily the work of many people. Does the future of chemistry belong to hedgehogs or foxes? I see no reason for the trends of the past five hundred years to change. Chemistry will essentially remain a game for foxes. This will be even more true in the future than it was in the past because the hottest fields in chemistry like energy, nanotechnology, chemical genetics and drug discovery are especially fox-friendly. However, occasional hedgehogs of the kind described above will also remain an integral part of its development. Foxes will be needed to explore the uncharted territory of chemical discovery, hedgehogs will be needed to probe its corners and reveal hidden jewels. The jewels will further reflect light that will illuminate additional playgrounds for the foxes to frolic in. Together the two creatures will make a difference. Physics has its share of foxes and it is quite possible that Newton had a greater impact on physics than Boyle had on chemistry. We should also not forget that Boyle’s law is more physics than Chemistry. Faraday was another über-fox whom both physicists and chemists would both claim as one of their own. I think that it’d be very difficult to slot Einstein into the hedgehog category given the diversity of his contributions to physics. I believe that there is a tendency to see foxes in areas of science that are closer to one’s own discipline and hedgehogs in more distant areas of science. You might see a synthetic organic chemist as foxy because (s)he has developed new synthetic methods, cracked some natural products and done some nano-stuff. However, a theoretical physicist just sees a hedgehog doing synthetic chemistry.